In a cultural center located in the part of capital city of Czech Republic (Prague 5) we have the capacity to share our experiences, activities, methods, contacts and host participant from the European Voluntary Service. The main objective of the „Life of Cultural Center“ is to allow the volunteer to see the background of a cultural center in the suburbs of Prague. KD Mlejn is a cultural organization, whose history dates back to 1988. It offers a wide range of activities, including theater performances, concerts, folklore courses and leisuretime activities. Lately Mlejn supports the new wave of contemporary circus in the Czech Republic. Natalia Kubiak was chosen from candidates by KD team. The main emphasis was placed on motivation, interest in culture, leisuretime and informal education. During the service he found out how is the cultural center from the backstage. What is necessary for its operation and smooth work, how to live in Culture Center in Prague. She had the opportunity to try out a variety of tasks associated with its work. Natalia got the opportunity to try out all the activities from theater technique, lighting design, audio mastering and graphic design to organizating performances, concerts and festivals. The main tasks of Natalia was active cooperation as teacher assistant in circus courses for children, with teachers from different parts of the Europe and the world. She extened her social and language skills, teaching skills and experience in working with children and young people. Participants in the courses (in which Natalia participated) are from different ethnic and social backgrounds. She participated various activities in different working groups, under the supervision of permanent staff. Her work in KD Mlejn had a positive impact not only on her work experience, social and language skills, cultural awareness and insights, but also affected workers and teachers of KD Mlejn, participants of childrens‘ courses and adult lessons, so as visitors of the cultural center. This project too place with one volunteer for ten months. During this time she was preparing her own project which was presented in the end of her voluntary service. 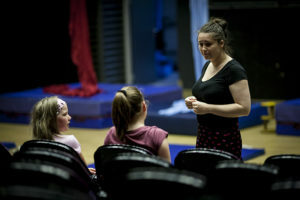 It was theatre-circus performance with children and young people from all the courses. With the help of lectors Natalia coordinated more than 100 children into consistent group which was organizationally very hard due to enormous number. She wrote up the screenplay, scenography and she created the video projection. The performance was presented not just for parents of children but also for wide public. Sharing experiences and outputs from the EVS was one of the steps how to spread the awareness of possibility to active self-develompment and non-formal education. Experience was shared via social media and personal contact among the volunteer, participants of courses, their parents and local community. Thanks to social media we were able to extend awareness to national and European level.